Guest post by Allison Engel, an Iowa State University graduate, has worked in higher education for the past 12 years. Yes, Gov. Reynolds, let’s talk about U.S. News & World Report rankings. But not the livability rankings, which do not include data from all 50 states in all categories. In this blinkered competition, Iowa snagged the No. 1 spot, including the top ranking for infrastructure. This must have come as a surprise to those who read the recent Federal Highway Administration report that Iowa has the most structurally deficient bridges in the nation, as well as one of the country’s largest collections of poor roads. The U.S. News & World Report rankings we should be looking at are the ones for our state universities. Here, sadly, the University of Iowa and Iowa State University have suffered serious declines during the Branstad-Reynolds administration. In 2015, the U of I was ranked 71st among national universities, a group that includes both public and private schools offering a full range of undergraduate majors and master’s and doctoral programs. This year, it is 89th – a drop of 18 places in four years. In 2015, ISU was ranked 106th among national universities. This year it was tied for 119th – a drop of 13 places in four years. The University of Northern Iowa is not included in the U.S. News national university rankings. Under the last Democratic administration, in 2008, both the University of Iowa and Iowa State were ranked significantly higher. 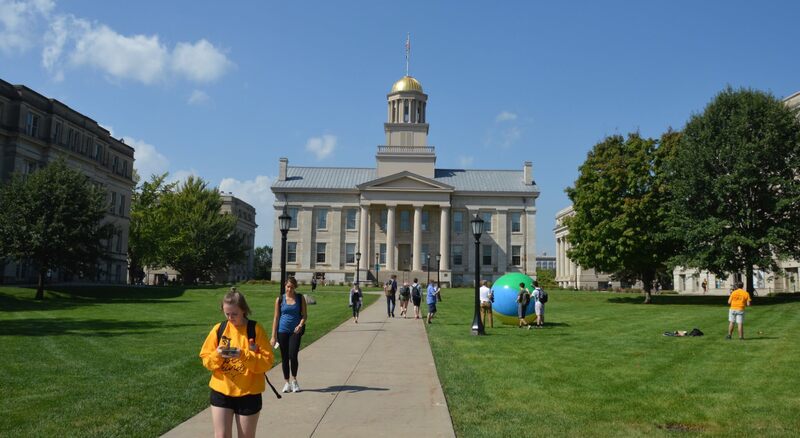 In 2008, Iowa was ranked 64th among national universities. ISU was ranked 85th. Compared to 2019, that’s a drop of 25 places and 34 places, respectively. Yikes. At a university not in Iowa, I’ve seen administrators have major meltdowns after dropping one place in the rankings. These rankings, as disliked as they are by some educators, matter in terms of reputation, faculty hiring and quality of applicants. They are routinely consulted by prospective students – particularly by those paying full tuition from other states – to decide what schools they want to attend. The rankings use information submitted by participating schools, but also include reputational measures. Basically, deans are asked to rank their peers on their academic reputation. So, the U of I and ISU are seen by their peers as slipping. Why? Well, in the past year and a half, Gov. Reynolds has presided over millions of dollars in cuts to the three state universities. Some of these cuts were made after the universities already had set their budgets, which is no way to run a railroad. University of Iowa president Bruce Harreld placed the blame squarely on funding woes. “Those rankings are a stark illustration of what happens when there’s not enough investment in higher education by the state and by students and their parents,” he told the Register the week after the 2019 rankings were released. It is dismaying to watch university hiring and salary freezes take effect, and academic centers close. As a result, our exceptional professors and researchers are getting picked off by well-endowed private universities that can offer more stability, better facilities and higher salaries. People our universities once promoted with pride are now bringing acclaim to other institutions elsewhere. So, Gov. Reynolds, don’t place too much stock in the livability ranking. It was based on statistics compiled before the last legislative session ended, when you and other Republicans gave an unprecedented tax cut to the wealthy. It did not take into account the undeserved 7.5 percent bonus your administration just shoveled to the out-of-state insurance companies who now oversee Medicaid and are depriving untold numbers of Iowa’s 685,000 poor and disabled citizens of adequate medical care. Instead, I’d like to hear you explain the steep drop in the U.S. News rankings for the University of Iowa and Iowa State during your tenure. NEXT POST Next post: “It’s Game On.” Can Late Surge Topple Steve King? But, but…Both U of Iowa and Iowa State have really good football teams! (yeah; that was sarcasm) If this is dismaying to me, a relatively recent Iowan (8 years), how disconcerting (and angry-making, one hopes) this must be to native Iowans! Both major universities have had solid reputations in the past, around the country. Those reps seem to be in danger, and it will take years to regain their statuses. And there is little reason for it. Terrific article, Allison. You spelled it out perfectly! Thanks for writing this. As a professor at the University of Iowa, I see every day how these cuts are harming our programs. Many of these, such as the Labor Center, have served their state and community for decades and have added to the variety of opportunities on and off campus. I see in my own unit a drastic drop in faculty numbers, with important fields now untaught. Students struggle to get into courses for their specialties as the number of available slots declines, making it hard to graduate in a timely fashion. Tuition is too high for even middle-class families, and students are burdened with debt and often forced to enter specialties they dislike rather than serving the community. Larger classes are more impersonal and cause stress for both students and teachers; the gold standard in education is and always will include personal contact. It is harder to attract graduate students since other universities pay teaching assistants and researchers more than we do, and it is harder for those who come to survive. A recent article made national news in which a graduate student in a prestigious program described her trips to the local food bank. The cuts affect everyone–key programs such as the Labor Center, class sizes, range of courses, and high tuition which eliminates many and places the other under undue stress. The younger generation is burdened at a time when we need more not fewer educated persons. Be sure to canvass and persuade others to vote!